I’m not an environmental nut. I have a friend who says that the Green movement is just a substitute for religion, which scares me because it appears to be so true. There are some who proselytize, but most seem to use their Green belief to atone for the sins of the populace at large, as if a two minute shower will make a difference when China and India both pour oceans of gases into the atmosphere. These little acts of faith are just tear drops in the salted sea, as far as I can tell, as effective toward changing the trend in global warming as prayer. So maybe it is odd that I enjoy flying so much with so little guilt. I really do feel that there are so few people flying that it just doesn’t matter. When I first was looking into buying our plane I worked out the fuel we’d burn going to visit land we had in the desert. It turned out to be about what our minivan (it was pre-Prius) would burn for the same trip. I would love to have an electric, or hybrid, airplane, but they aren’t around yet. I am happy that we have one of the more fuel-efficient models out there, but I still had a lot of explaining to do at dinner parties where we were all kicking our collective Prius tires. Now I have a sticker. That’s so much easier. Al Gore jets about the country giving his little “the world is ending, the world is ending” talk with slides. (“The World is Ending” is a typical religious message, obviously.) So he complains about greenhouse gases and then climbs onto a private jet to get to the next city or to get back to his ten thousand square foot home. He claims his life is carbon neutral. I researched it. My life is not carbon neutral and I don’t intend to make it that way. We live in a fairly modest home in a suburban fabric in the sprawl of Los Angeles. I can do more just by helping my neighbors adjust their sprinklers (which I’ve done) than in any amount I shorten my shower by. 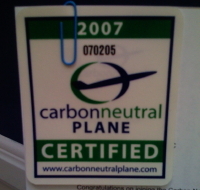 The plane, though, is easy to make carbon neutral, thus changing the usual cocktail conversation. I wonder what designation I could get if I could get Al Gore on board N971RD. Air Force Two Alpha? Air Force Point Niner, since he was almost the president?